Published: Aug. 11, 2013 at 07:43 p.m. Updated: Aug. 15, 2013 at 05:40 p.m.
As the 2013 college football season looms on the not-too-distant horizon, here is a look at the top seniors to watch this fall with the 2014 NFL Draft in mind. The 6-foot-5 1/2, 310-pound Matthews is the son of Pro Football Hall of Fame lineman Bruce Matthews. Matthews, the son, elected to stay in school rather than leave early for the NFL draft. This decision can help his professional prospects tremendously. Matthews -- a good athlete with long arms, quick feet and a 5.1-second 40-yard dash time -- will play left tackle this season (assuming the spot vacated by No. 2 overall draft pick Luke Joeckel). The position switch will help increase Matthews' draft value. Who's better, Jordan or Barr? Barr (6-4, 240) came to UCLA as a running back, but converted to outside linebacker in the spring of 2012. Barr -- who runs a 4.7-second 40-yard dash -- was UCLA's second-leading tackler in 2012 with 83, and he led the Pac-12 with 13.5 sacks. He has long arms and a very good burst off the edge. Barr also seems to have very good instincts. Exum (5-10 5/8, 218) decided to stay in school for his senior season, but tore his ACL in January while playing pick-up basketball. He would have cracked the top five on this list if it wasn't for that injury. Exum -- who runs a 4.5-second 40-yard dash -- finished 2012 with five interceptions and 16 pass breakups. The 6-0, 213-pound running back previously played at the University of Houston, but transferred to West Virginia for his final season of eligibility (he graduated from UH in May, so he won't have to sit out a season). This guy can run like the wind, having run a 4.46-second 40-yard dash. He should be great in the West Virginia system, and could be like St. Louis Rams first-round draft pick Tavon Austin, who played some running back against Oklahoma and rushed for a school single-game record 344 yards. Last season was Grice's first at ASU after two seasons playing junior college ball. Grice (6-0, 204) had 19 touchdowns as a runner (11) and receiver (eight) despite sharing time with two other running backs in a rotational situation. McCarron has the height (6-4) and speed (clocked in the 40-yard dash at 4.75 seconds during Alabama's spring junior day) necessary for the position. He completed 67 percent of his passes in 2012 for 30 touchdowns and only three interceptions. This guy is a winner. Morris stands 6-foot-2 and has run a 4.67-second 40-yard dash on grass (which produces slower times than artificial turf). He has above-average arm strength. He was to be redshirted in his true freshman season of 2010 but was thrust into action late in the season, making four starts and going 2-2 in those games. Morris has good upside and could easily move up to the No. 1 quarterback prospect spot before the 2013 season is over. The 6-foot-4 1/2, 255-pound Jeffcoat is the son of of former Dallas Cowboys and Buffalo Bills defensive end Jim Jeffcoat. When I was with the Cowboys, we selected Jeffcoat in the first round and he turned into a player who performed at a high level for a long time, finishing his career with more than 100 sacks. Jim's son Jackson has the same traits. Jackson is a competitive player with speed (4.75 seconds in the 40-yard dash), quickness and athletic ability. The 6-7, 340-pound Henderson plays right tackle and improved greatly over the last half of the 2012 season, not allowing a single sack in the Hurricanes' final eight games. Henderson -- who runs the 40-yard dash in 5.0 seconds -- was a highly touted high school player from Minnesota, earning high school lineman of the year honors. He had originally committed to USC before deciding to attend Miami. Sutton (6-0 1/2, 285) is undersized for the position, but did have 13 sacks and 10.5 tackles for loss in 2012 despite missing two games (he was hurt on the first play of the Oregon game and missed the UCLA game). He has great quickness (4.85 in the 40) and strength for his size. Sutton is also a great competitor. The 6-6, 305-pound Mewhort runs the 40-yard dash in 5.25 seconds and is a solid player. He's a good run blocker with high character and intelligence. Mewhort plays left tackle and started at guard for the Buckeyes as a true freshman. Stone (6-3, 293) boasts a 5.2 40 time. He is a part of a very experienced Volunteers offensive line (combined 123 starts, the second most of any team at the FBS level). Martin (6-4 1/2, 316) has played both left tackle and right tackle at Notre Dame. Martin -- a three-year starter for the Fighting Irish -- runs the 40-yard dash in 5.25 seconds, has long arms and good feet. His father, a lawyer, works for the NCAA. Davis (6-2, 200) runs a 4.5-second 40-yard dash. He considered leaving school after last season, during which he averaged 16.5 yards per catch and had seven touchdowns. He is a big-play receiver with the size and speed necessary to compete in the NFL. Davis possesses a lot of upside. A stalwart on UNC's offensive line, Hurst (6-6 1/2, 310) has made 36 starts. Hurst runs the 40 in 5.3 seconds and has long arms. While he plays left tackle for the Tar Heels, his best position in the NFL might be at right tackle. The Bullough name has been a part of Spartan football for many years, with Max as a third-generation player at Michigan State. Bullough (6-3, 250) was the leading tackler on his team with 112 stops in 2012. He is very good at taking on blockers and anticipating plays. Bullough -- who runs the 40-yard dash in 4.8 seconds -- has started 27 consecutive games. Boyd is not tall (6-0 3/4), but has been successful over the past two seasons (winning 19 regular-season games). He plays in a quarterback-friendly offense. He had a very good statistical season in 2012, completing 67.2 percent of his passes with 36 touchdowns. Boyd displays good arm strength and likes to roll out and throw. Murray is not real tall (standing at 6-1), but he had a higher passer rating as a junior (174.82) than former No. 1 overall NFL draft picks Matthew Stafford (153.5) and Andrew Luck (170.2). Murray finished 2012 with 3,893 yards passing, 36 touchdowns and 10 interceptions. However, he isn't much of a runner (0.9 yards per attempt in college career). Thomas (6-5 5/8, 256) looks the part of an NFL quarterback. He has 4.67 40 speed and a great arm. However, he is very inconsistent. After a sophomore season with 3,013 yards passing for 19 touchdowns, 10 interceptions and a completion percentage of 59.8, Thomas' production dropped off in 2012 (2,976 yards, 18 touchdowns, 16 interceptions, 51.3 completion percentage). Barrow (6-1, 230) was the Tigers' second-leading tackler in 2012 with 104 tackles. He is entering his third year as a starter. Barrow, who runs the 40-yard dash in 4.8 seconds, is a very competitive player with good instincts. He plays a lot like former LSU linebacker Kevin Minter, the Arizona Cardinals' second-round pick in the 2013 NFL Draft. The 6-3, 318-pound Watt is entering his third season as a starter for the Fighting Irish (he's currently the team's left guard). He runs a 5.3-second 40-yard dash, has the strength necessary to play guard and is a good run blocker. Loston (6-0 5/8, 207) tied a school record with a 100-yard interception return for a touchdown last season. He finished the 2012 season with 55 tackles and three interceptions. Loston -- who sports a 40-yard dash time of 4.55 seconds -- has the necessary cover skills and toughness for the position. Hoffman (6-3, 216) runs a 4.58-second 40-yard dash. He does not have great speed, but runs precise routes. Hoffman will catch everything thrown to him. A better passer at quarterback this season (sophomore Taysom Hill is set to take over at the position) should help with Hoffman's production, which was outstanding last season (100 catches for 1,248 yards and 11 touchdowns). Joyner's size (5-8 1/4, 187) is a concern. Still, he was a first-team All-ACC selection in 2012 after recording 51 tackles and an interception. Joyner has enough speed (40 time of 4.5 seconds) that he can play cornerback, a position he is expected to see more time at this season. Fiedorowicz (6-5 3/8, 264) runs the 40-yard dash in 4.85 seconds. He changed his mind about entering the 2013 NFL Draft after coming on strong late last season. Fiedorowicz is a very good blocker, and a big target with good hands. Fales (6-1 3/8, 219) was a backup to San Francisco 49ers quarterback Colin Kaepernick while the two were at the University of Nevada. Fales ultimately decided to transfer to San Jose State, where he has displayed really good accuracy and movement. He doesn't possess a cannon for an arm, but has enough arm strength to be a factor in the NFL. Garoppolo (6-2 1/4, 222) has a real strong arm and is athletic (he has a 40 time of 4.8 seconds). He hails from the same school that produced Dallas Cowboys quarterback Tony Romo. The 6-4 7/8, 316-pound Coleman is a big, strong player with good feet and the ability to get off blockers. Coleman -- who runs the 40-yard dash in 5.15 seconds -- is a developing player with a lot of upside. 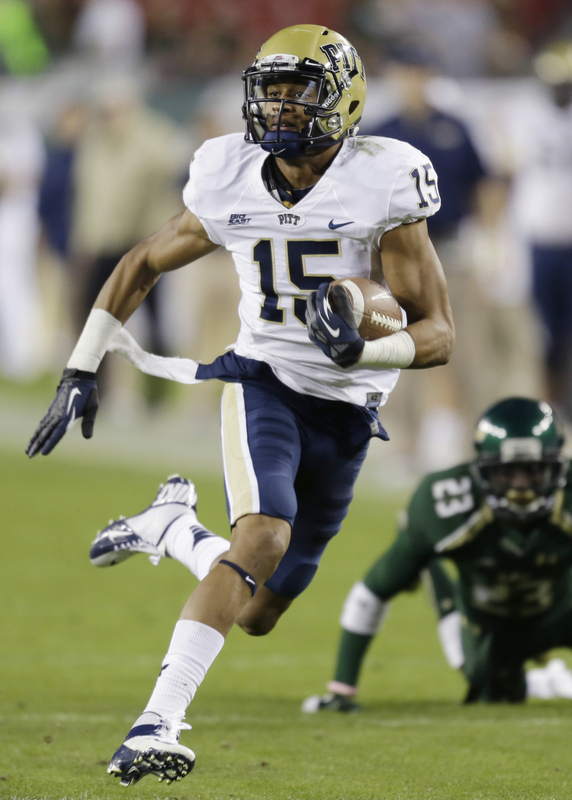 Devin Street rates among Gil Brandt's top five college football senior wide receivers.